Today is my feast day: St. Martin de Porres, whose name I am proud to bear. But not in the Archdiocese of Cincinnati. This happens to be the anniversary of the dedication of our cathedral -- and that takes precedence. So I will keep my feast day next week. 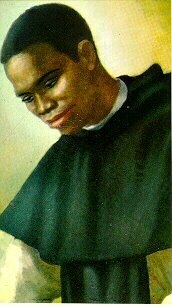 I am delighted that, by divine providence, my parents chose to entrust me to the care of St. Martin de Porres, and I consider it a light and pleasant task to make him better known. I am confident that St. Martin has prayed for me ever since my conception, so how can I be ungrateful? May Brother Broom keep you in his heavenly prayers. You could keep S. Martin of Torres, instead, Father, or you could keep them both. richard -- I am guessing you mean St. Martin of Tours, whose day is Friday. Alas, I have a funeral that day. But I will keep my own feast day tomorrow.